As with other laparoscopic operations, the strategy for obtaining a high degree of success is to reproduce the open operation and simply change the approach from an incision to the percutaneous placement of instruments. Both percutaneous cross-trigonal and laparoscopic extravesical reimplantations have been described. success—approximately 75%. However, concerns regarding the use of an agent obtained from cows—the possibility of transmitting infectious agents and allergic reactions—along with the tendency of collagen to be absorbed over time have limited its use. Deflux is a synthetic material which is easy to inject and appears in initial reports to be durable. Success rates of 72% and 86% following a single injection have been reported (1-3). Success is related to the grade of reflux ranging from 90% for grade 1 reflux to 65% for grade 4 reflux. Most failures can be salvaged with a second injection. 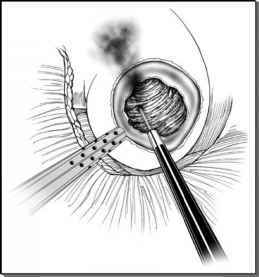 Ureteral obstruction occurs in only about 1 in 1000 injections. The introduction of this less invasive procedure to treat reflux has lowered the threshold for surgical intervention. Many parents will prefer an outpatient procedure to years of antibiotic prophylaxis and repeated radiographic studies. Indeed at some centers nearly all patients are treated initially with an injection, while other centers still use injection therapy only in those patients that fulfill the traditional criteria for surgical intervention. Laparoscopic/percutaneous approaches to ureteral reimplantation have been developed in an attempt to achieve the high success of open reimplantation with the decreased morbidity associated a minimally invasive approach (4-7).